***I got a wife and a cold on the same day, but have got rid of the last pretty speedily. I don’t dislike this place, it is just the spot for a moon; there is my only want, a library, and thus I can always amuse myself, even if alone. I have great hopes this match will turn out well. I have found nothing as yet that I could wish changed for the better; but time does wonders, so I won’t be too hasty in my happiness. I will tell you all about the ceremony when we meet. It went off very pleasantly, all but the cushions, which were stuffed with peace-stones I believe, and made me make a face which passed for piety. My love to all my relatives; by the way, what do they mean to give me? I will compromise, provided they let me choose what I will have instead of their presents, nothing but what they could very well spare. 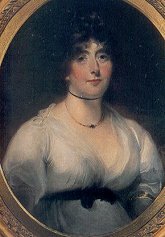 Byron’s wife, Annabella, was Lady Melbourne’s niece. Barely a year later, relations between husband and wife had deteriorated terribly. Annabella fled to her parents’ home, taking their newborn daughter with her. The next letter in this series was written soon after her departure and is one of the most emotional letters which Byron wrote. His usual wit, and detachment are absent. Instead, he makes a heartfelt plea for his wife’s return.